OATHMARK: BATTLES OF A LOST AGE Fantasy Mass Battle Game from Osprey Games. Miniatures by North Star and Osprey. Empires have fallen, and the land is broken. The great oathmarks that once stood as testaments to the allegiances and might of nations have crumbled into ruin. Now is a time of warlords, tyrants, and petty-kings, who carve out their own realms and inscribe their oathmarks into standing stones, ancient trees, and the bones of their enemies. In this lost age, fealty and loyalty are as valuable as gold and as deadly as cold iron, and war is ever-present. 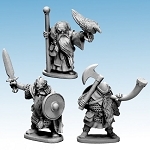 Created by Joseph A. McCullough, the designer of Frostgrave and Frostgrave: Ghost Archipelago, Oathmark is a mass-battle fantasy wargame in which players command armies of dwarves, elves, goblins, and men, and campaign to expand their realms and secure the loyalty of those they conquer. 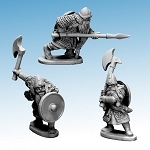 Oathmark allows players to field the fantasy army they have always wanted, whether a company of stalwart dwarves or a mixed force with proud elves and wild goblins standing shoulder-to-shoulder in the battle line.